Q. After you have had your breakfast, and whilst the family is finishing theirs, what do you do? A. I take a large can of boiling-hot water up-stairs, into the bed-rooms, and also a slop-pail. I go through all the rooms, open the windows, unless the weather be bad, empty the slops, scald the different vessels, and wipe them dry with cloths I keep for the purpose. A. I put on a largo, clean, bed-making apron, which goes all round me, and so prevents my gown from soiling the bed-clothes or furniture. Q. What do you do then? A. I dust two of the chairs, and place them at the foot of the bed. Then I draw back the curtains, and remove the counterpane, blankets, and sheets, one by one, turning them over upon the chairs, and taking care not to let them drag upon the floor. In taking off the sheets, I give each of them a shaking, to cool them by letting the fresh air pass through and over them. I also shake the pillows and bolster, and lay them aside. Next I shake the bed, and leave it to air. Q. Of course, in removing the clothes, you take care to keep them in right order, so that when you come to make the bed, they will fall into their proper places, as they were before; and that the seams of the sheets will not be inside? Q. Well, as you will probably soon be wanted to remove the breakfast things, how do you proceed? A. I must leave my apron up-stairs, to put on again when I make the beds. I take the slop-pail down, empty it, rinse it well, and place it to drain. A. I carry up a tray to the parlour, on which to remove the breakfast things; and if there are any crumbs on the floor, I bring a dust-shovel and hand-brush to sweep them up. Next, I wash the breakfast things, and the glasses that were used last night. A. Then, if you please, I will receive instructions for dinner, make the necessary preparations, and afterwards return to finish the beds and bed-rooms. Q. Well, having completed your arrangements preparatory to cooking the dinner, how do you proceed with your bed-making? A. Having washed my hands, I again put on my large apron. Then I shake the bed well, in all directions, turn it over, and take care that the feathers do not get into lumps. Q. But the mattresses—you know there are generally two or three of them; the lowest, which is stuffed with straw, and called a paillasse; and the others filled with horse-hair, wool, or flock—how do you manage them? A. The paillasse does not require to be turned more than once or twice a week; but the mattress, or mattresses, as well as the bed, must be shaken and turned over every day. Q. What is the object of this shaking and turning? A. To give them the advantage of fresh air, and thus keep the bedding cool, and sweet, and wholesome. A. After I have thoroughly shaken and turned the mattress, I replace the bed, laying it square with the bedstead, smooth and even, but not flattened; then put on the under blanket, and over that the under sheet, straight and smooth; tucking the sheet well under the bed on the upper mattress. A. Then I shake up the bolster and pillows, and lay them straight in their places at the head of the bed; after which I put on the upper sheet, with the wrong side uppermost, leaving enough at the feet to tuck in firmly, and sufficient at the head to turn down. Next, I place the blankets—one, two, or more, according to the time of the year, or the wish of the occupant of the bed—and when I have put the last blanket on, I tuck in the whole together, firmly, with the upper sheet, and, according to their length, fold them over in one or more folds. Q. What more have you to do? A. I next put on the counterpane or quilt. I do not tuck that in, but leave it to hang equally low at each side, and at the foot of the bed. Q. What is your rule for placing the counterpane properly? A. There is generally a flower, or some other conspicuous figure, in the centre of the counterpane; and when I have got that at an equal distance, on the top of the bed, from the head, foot, and sides, I know that it will fall and hang properly. A. Then I draw my hand across the counterpane, along the lower edge of the pillows, so that their form may be seen beneath. Q. What is your rule for laying the sheets properly, so that you may not turn them head to feet, or the inside outwards? A. When I put on clean sheets, I always put the mark of the under sheet at the right-hand corner, at the foot of the bed; and the mark of the upper sheet, also at the foot of the bed, but at the left-hand corner; by which means the sheets are always kept in their proper places. Q. Well, after you have arranged the counterpane in the way you said, what else have you to do? A. If the bedstead be a four-post one, I draw the lower curtains towards the feet of the bed; then I fold them in and out, in folds about half-a-yard wide, and turn them on the bed, from the post towards the middle. Next, I fold the head curtains in the same manner, and place them in a straight line upon the pillows. 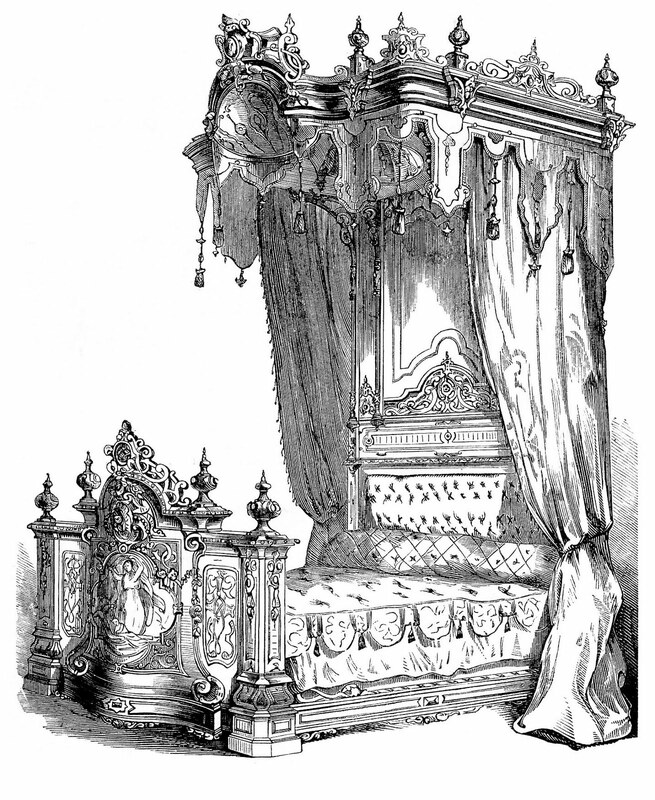 Some ladies prefer having all the curtains drawn to the head of the bed, placing the lower curtains thus upon the pillows, and allowing the head curtains to hang down. Q. If the bedstead be one of the French sort, or a tent, how do you dispose of the curtains? A. Then, ma’am, I have only to loop them up. Q. Have you anything else to do in the bed-rooms? A. I have now only to draw the flue gently from under the bedstead with a long hair-broom, or with a clean, damp, but not wet, flannel; to dust the furniture; to fill the jugs with soft water, and the bottles with spring water; and to see that everything is in its place. Q. What have you to do in the bed-rooms in the evening or at night? A. 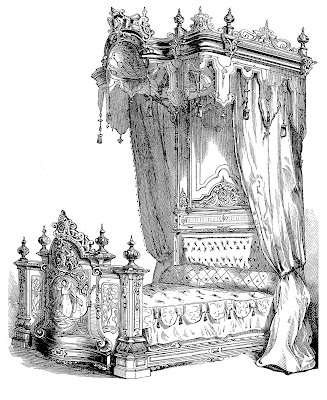 To prepare the bed by turning down the counterpane, blankets, and upper sheet, one over the other, so that the edge of the fold may reach nearly as high as the middle of the pillows; to draw the bed-curtains; carefully to close the windows and pull down the blinds; to remove the dirty water from the wash-hand basins; and to replenish the jugs and water-bottle.